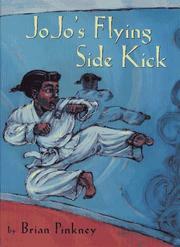 Jo Jo is worried about her flying sidekick test in Tae Kwon Do. Her grandfather and mother give her advice but she is still worried. When the test begins, she freezes. But then she realizes just what to do. Pinkney, Brian, “Jo Jo's flying sidekick,” Children's Picture Book Database at Miami University, accessed April 21, 2019, https://dlp.lib.miamioh.edu/picturebook/items/show/6328.